Before the storm — Aspen Mountain requires significant natural and man-made snow before top-to-bottom skiing can be offered. Officials are hopeful Friday's storm will deliver. Skiers and snowboarders have a lot riding on the snowstorm forecast to roll in Thursday night, Nov. 16, and last into Saturday, Nov. 18. Aspen Mountain and Snowmass Ski Area need additional snow and extended cold temperatures for snowmaking operations in order to open terrain as scheduled on Thanksgiving. “Obviously we’re waiting for the latest pulse,” Rich Burkley, Skico senior vice president of strategy and business development, said Thursday afternoon. The National Weather Service early Thursday upgraded its forecast and issued a winter storm warning for Colorado’s central mountains. It went into effect at 11 p.m. Thursday and is scheduled to last until 5 a.m. Saturday, and the area includes Aspen and the Elk Mountains. The warning prompted the Colorado Department of Transportation to close Independence Pass for the season at 7 p.m. Thursday. The weather service predicts “8 to 14 inches, with localized amounts up to 18 inches” above 8,000 feet by Saturday morning and wind gusts as fast as 55 mph. Meteorologist Cory Gates of micro-forecaster AspenWeather.net forecasted 2 to 4 inches of snow above 9,000 feet at Aspen and Snowmass by dawn Friday with a possible rain-snow mix at lower elevations. Gates sees a big change late Friday afternoon or early evening, when a cold front passes through the Aspen area. He is forecasting 6 to 11 inches at the ski areas by dawn Saturday, depending on the elevation, and 3 to 6 inches in Aspen. 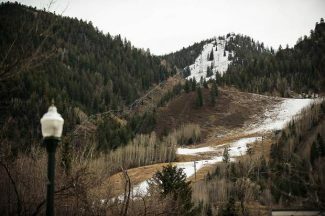 Skico officials are certain of opening some amount of terrain at Aspen Mountain and Snowmass on Thanksgiving. The company sent an email Thursday touting the opening one week away. Lifts will start spinning at 9 a.m. at both ski areas. Burkley is feeling more optimistic about getting a decent amount of terrain opened than he was earlier in the week. Gates said skies will clear late Friday night and temperatures will drop to single digits at mid-slope on the ski areas and 10 to 15 degrees at the airport. It will remain cold throughout Saturday and into Saturday night. Burkley welcomed news of cold temperatures settling in for the weekend as it will benefit the snowmaking. “We should be able to run straight through,” he said.